Chip shops have become an iconic part of everyday life in the United Kingdom. Whatever town and village you go to there is bound to be at least one chip shop open. According to the Mirror British chips the number one chip shop in Britain is Millers Fish & Chips in Haxby, North Yorkshire. but you do not have to travel all the way there to enjoy this quintessentially British meal. There are many more chip shops throughout the UK of high quality that are worth visiting. After the aforementioned Millers in Haxby this is the second best chip shop according to the Mirror. If you find yourself in Devon then it is worth travelling to this particular chip shop. 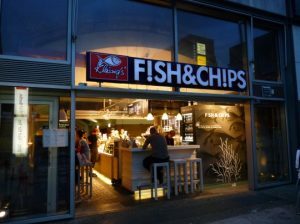 Located close to the coast, the fish here is guaranteed to be fresh which compliments the chips very nicely. When in Scotland you need look no further for the finest takeaway chips than this humble shop. It has ranked consistently as one of northern Britain’s best places to go to sample the finest chips. This one is located in Wales and has been named as the best place in that country for delicious chips. Wales has an abundance of fantastic takeaway joints for real British grub. If you can’t find Penaluna’s there are plenty more out there to satisfy your appetite. Located in County Tyrone, the Dolphin has been named by the Mirror as the best chip in all of Northern Ireland. This is quite an honour considering that this area has no many great takeaway establishments on offer.